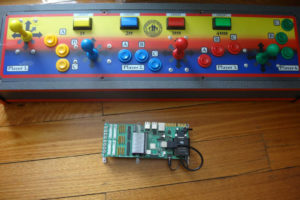 The RaspberryJAMMA 4 Player Adaptor is now available. Adding the 4 Player Adaptor to any RaspberryJAMMA v2 or v3 is simple and adds support for players 3 and 4. It can plug in directly to any 4 player Konami (eg. TMNT, Simpsons etc) or NBA Jam cabinet with no need for wiring mods or can support up to 6 buttons per player (+start, coin etc) for custom setups. Previous: Previous post: ARpiCADE 3.82 out now!